March is the season to spring clean your home, why not spring clean your appliances too? Solve all of your dishwasher dilemmas with these simple and efficient dishwasher maintenace and energy tips. Eliminate a step from your cleaning process- no more pre-rinse! Save up to 20 gallons of water by hand-scraping your dishes, instead of running water for your pre-rinse. Not only will this save on water waste, but it can save your glassware, too! 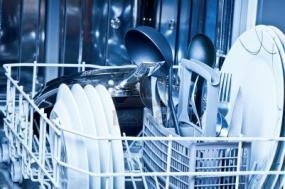 Dishwasher detergent is dependent on food particles to do its job. By having no food to attack, it usually moves to glassware, leaving your dishes cloudy with permanent etching damage. To get cleaner dishes, purge your water in the sink before running the dishwasher to make sure it’s hot from the beginning of the wash cycle. The hot water will help break down stuck-on food particles and prevent clogs. Make sure your hot water heater is set between 120 and 125 degrees. Give your dishwasher a wash of its own by running an empty cycle with a cup of white vinegar. The cleaner will remove soap and calcium build-up that makes your dishwasher worker harder than it has to. Cooking, baking and living in a green kitchen lifestyle is as simple as choosing the correct dishwashing cycle. Use short dishwashing cycles and save the normal dishwashing cycles for your dirtiest dishes. Avoid using the “rinse hold” setting, since it uses three to seven gallons of hot water for each use. Give your dishes a breath of fresh air by turning your dishwasher setting to air-dry or open the dishwasher after the rinse cycle.